In Episode 95, we tackle the subject of creating mixes. Promote ourselves, obviously. If you’re a DJ, but don’t have a mix, how do you promote yourself as a DJ? Having a mix is part of the foundation of your brand. Self reflection. To listen back and find our own weak points, as well as take pride in our strengths. Continue to accentuate the areas in which we do well, and work on the things we don’t, that way we are better prepared for the live gigs. Digital DJ’s have it easy…just press the record button on your digital DJ software. Could always go old school (might have to if you’re a vinyl junkie) and record to outboard gear or another computer. APATHY. Aren’t we just adding to NOISE? Not enough feedback, people ignore mixes. 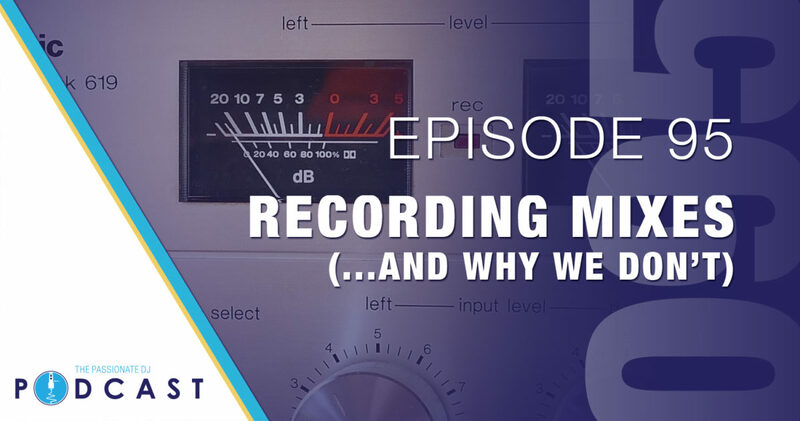 What are your reasons for recording mixes? What are your tried and true methods for promoting those mixes and getting listeners engaged? Send us a voicemail, email, or leave a comment below!